Vivus Architecture + Design » Archive » Solar Panels Operational! This week, Mary and I visited a client’s home to review the solar power and hot water systems thet were recently installed. Here is the power converter, which received DC power from the solar panels and converts it to AC power, and Greg, the installer. 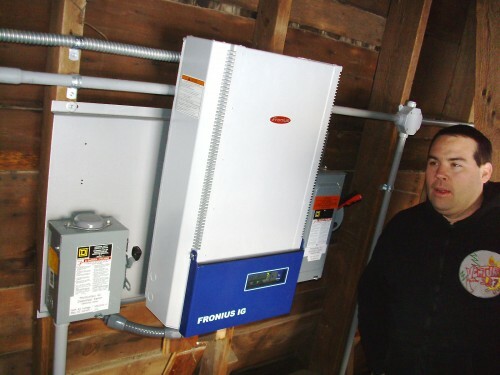 This is one of two inverters installed inside the old barn, which proved to be a fine place to mount the photovoltaic panels. 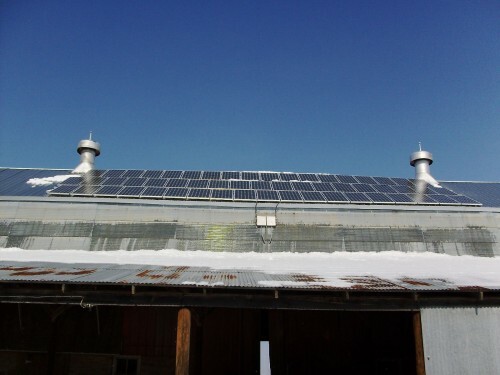 Access is only occasionally needed, so the inverters were installed close to PV panels. 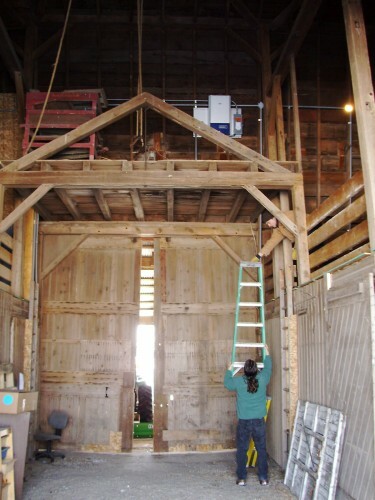 The inverters are truly a minimal intrusion into the barn space. The panels face south at about a 35-degree angle to match the existing roof slope. They are unobtrusive on top of the silver metal roof. 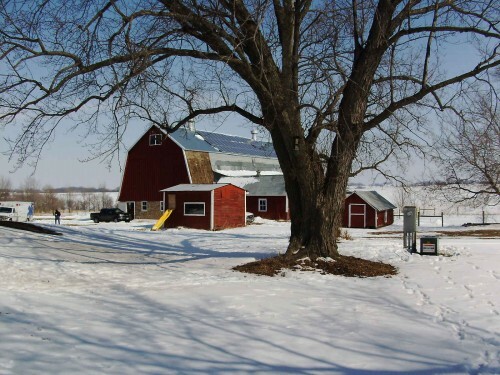 We advised our client to locate the panels on the barn instead of the house due to the existing trees around the house and the fine solar access afforded on the barn, as shown below. The solar domestic hot water panels, however, fit easily on the roof of the home, where they will receive plenty of sunlight. The hot water storage tank thermometer read 125 degrees despite the 38-degree outdoor temperature. Innovative Power Systems designed and provided both hot water and photovoltaic panels systems. Our role has been primarily advocacy and consultation on the solar systems, which were added late in the design process. Where appropriate in all our projects, we incorporate “solar ready” strategies into our projects so that our clients can easily and affordably add these systems when the time is right. In this case, the SDHW systems dovetailed with construction and the PV system followed shortly thereafter. Click here to see some portfolio images of this project, which at this point are largely planning images. We hope to add more photographs this spring. 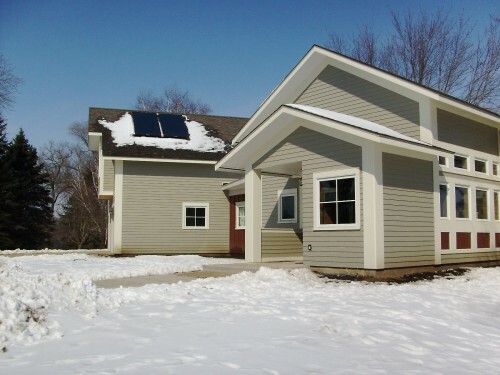 Posted in All Entries, Best Practices, Sustainability Comments Off on Solar Panels Operational!